Perennials There are 343 products. 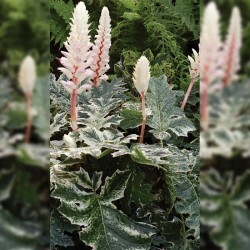 Acanthus mollis 'Whitewater'®(Acanthe) Acanthaceae A new graphic and vigorous selection. Green semi-evergreen splashed dun rime. 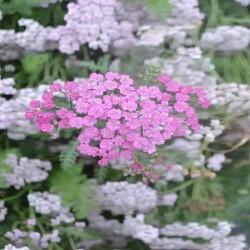 White and pink flowers used in bouquets upright. Beautiful to raise massive and stews. Drained soil, rich, fresh to slightly dry. 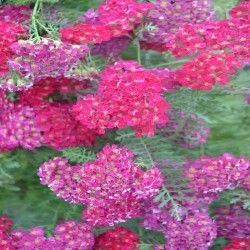 Achillea millefolium 'Cherry Queen'(Achillée) Asteraceae A beautiful raspberry color for this yarrow to sturdy stems and fine cut foliage, lapse. Beautiful countryside for dry bouquets. 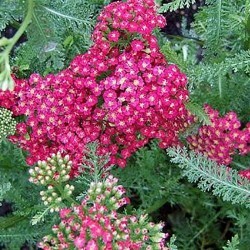 Carefree plant that adapts to any type of soil. Cast off after the first flowering to see it bloom again. 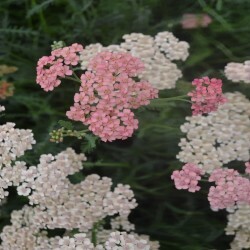 Achillea ptarmica 'Boule de Neige' (Achillée) Asteraceae Plant rhizomes creeping, charming and vigorous, it blooms longer in small white pompoms. Fold short for a second flowering. Can be dried. 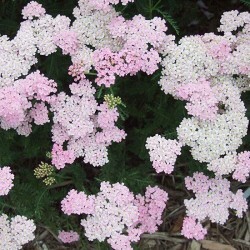 Cool even clay soil, tolerates partial shade. This small linear leaves, shiny, gilded, very nice effect of a basin's edge or in shaded hotpot. 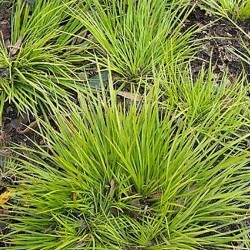 Spiky foliage, semi-evergreen. Slow growth. Ordinary soil, marshy submerged at -10 cm. 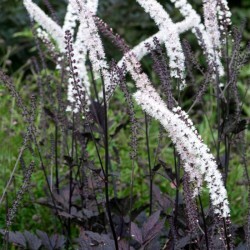 Actaea 'Queen of Sheba' ®(Cierge d'argent) Ranunculaceae A new low country. 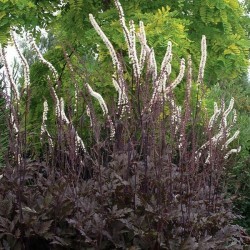 High perennial foliage (void) purple chiseled port bouquet. 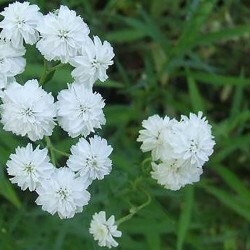 In late summer, blooming on large poles delicious ears bent , perfumed whites. Solid background. Humus-rich soil, deep, cool. Actaea pachypoda (Cierge d'argent) Ranunculaceae Spring flowering for this silver candle. 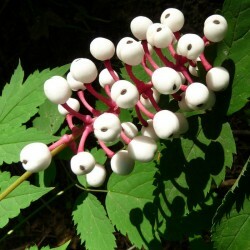 White Swab followed by a remarkable and long fruiting (6 weeks) in clusters with red stems bearing white berries pierced with a "little eye". Fine foliage (deciduous) cut. Earth drained humus and fresh. Actaea simplex 'Brunette'/Cimicifuga simplex 'Brunette' (Cierge d'argent) Ranunculaceae Perennial high to very beautiful dark purple foliage. Flowers in long white fragrant candles. Sol fresh, humus in partial shade . To associate with : aconite , anemone japan, aster , persicaria , sanguisorba . 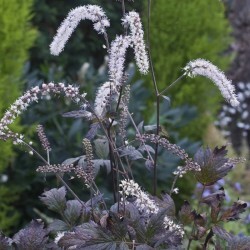 Actaea simplex 'Hillside Black Beauty'(Cierge d'argent) Ranunculaceae A silver candle to end foliage (void) chased, purple copper early in the season to finish black moiré summer. Long silvery white corn to sweet perfume that attracts butterflies. Perennial high , distinguished for solid shade . Drained soil , humus and fresh.